Tonight there was an informational at SCCC for a new program they plan on starting next year. Actually, next month. The brewers at Saranac, Adirondack Brewing, Shmaltz Brewing, and Rare Form helped create a pilot program that they hope will give the participants the entry level skills needed to work at breweries here in the region and elsewhere. Other than programs in Pennsylvania and North Carolina, the majority of the university/college based programs are out on the West Coast. I thought the CIA was starting a program of their own, but it looks like they are just offering a class. This program could very well be the first here in New York! There were the usual introductions and a brief overview of the program. There was a lot of information being given, so what I write here is not all of it, and it could very well be inaccurate. It is modeled after programs used in Europe, and focusing on the specific skills the participating breweries are looking for. Mentions of manufacturing, processing, sanitation, safety. It will be a 13-week non-credit program; classes will be held twice a week, with the possibilty of some weekends. There will be visits to different breweries, and some hands on experience to go alongside the classroom teaching. The price of this program will be a little more than what I paid for one class at SCCC. The process of applying for the program takes more than filling out a form. You have to make an appointment at the One Stop Center in your county. Never heard of a One Stop Center? Neither did I until tonight. It's a workforce/career center. What you discuss with this person I'm not too sure. Probably see if you would be a good fit for that kind of career. There's a part about being eligible for money to pay for this program, somethingsomethingsomething. There are online tests you have to take, see how well you do at math (ugh). A resume is submitted. 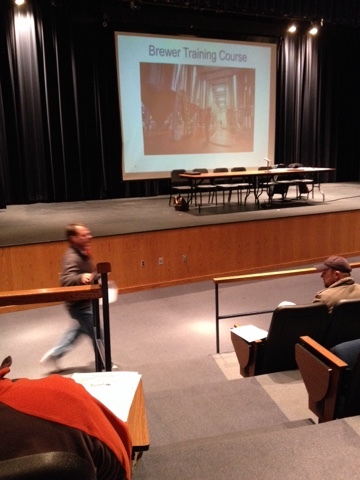 Lots of waiting (or maybe not because the program starts soon), and the final decision is made by the breweries. They are only selecting 15 people for this, with a handful to be placed on a waiting list. Really doesn't make me feel good about my odds. There were a lot of people at the informational tonight. Majority are homebrewers; majority male. There were probably seven women in the audience, including myself. Other than myself and two of my classmates, pretty homogenous.